The Pittwater Artists Trail hold two open weekends throughout the year – in May and in October this year, the first of these popular weekends running this May 17-18. Throughout the year some of the artists on the trail have Open Studio Days as well as taking part in the Trail Weekends - a little on each of these creators, a sample of their works and their open days gives you a guide to a weekly mini-Pittwater Artists Trail that emphasises the dynamic community of artists Pittwater is home to and the glorious works they are creating. Most artists on the Trail are happy to open their studios by appointment if they are not listed as having permanent Open Studio days here. You can find contact details for each artist on their page within the Pittwater Artist Trail website. Ring to arrange your visit. Our Artist of the Month for May is one of the artists on the Pittwater Artist Trail – Vicki Ratcliff – a wonderful and talented painter. 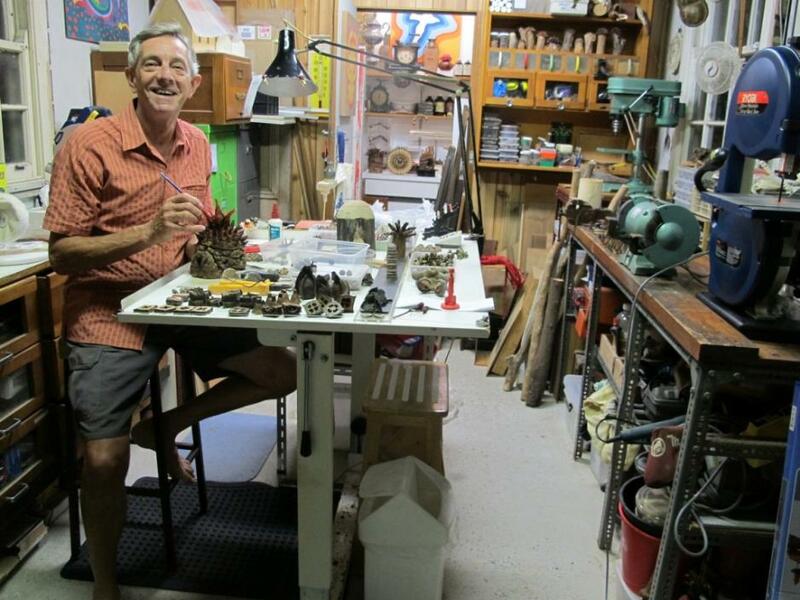 Our Profile of the Week this Issue is Geoff Searl, not only a fellow artist on this trail in the medium of sculpture, but also a gentleman who has seen much of Pittwater evolve, including its artist’s colony. The studios listed here offer regular opening times for visitors to drop in. Come and have a chat and see the artists at work and treat yourself to an artwork that has been locally inspired, designed and created. After 40 years as a midwife, I enjoy retirement in the tranquility of my ART GARDEN at Clareville Beach. I love creating fantasies in a variety of media. My journey into art began when I decided to mosaic a family memorial in my garden after my sister died in 2003.This led to many of my garden walls being covered with mosaic pictures and the creation of a Celtic medicine wheel. A friend introduced me to the fun of encaustic painting which is sometimes called fantasy art and dates back to the Byzantine era. Jewellery making followed using semi precious stones, crystals, shells, feathers and hand made ceramic beads. Dichroic glass fused in a microwave kiln opened up another avenue for making unique jewellery. Then I was drawn to the vibrant colours and beautiful patterns caused by salt, alcohol and even hair spray on silk. Followed by exploring the techniques of marbling, felting and gutta. I decided to share all this fun and offer classes to adults and children in the Art Garden. The Artist Trail has opened the door to meet many people and share and encourage them to experience the fun of creating. It is never too late to give it a go! Have a Friday or Wednesday adventure and visit my ART GARDEN and studio at Clareville Beach. You could combine a picnic on Clareville Beach or lunch at 'The Clareville Kiosk' all a short walk from my home. I would love to share the fun of my mosaic, silk and encaustic painting, dichroic glass and polymer jewellery creations or just enjoy a chat about the beauty of Pittwater. My open hours are 11.00 am till dark. Robyn Park in her ART GARDEN- Below: One of Robyn's beautiful creations. Having been gainfully employed in her own therapy practice (deep tissue massage and psychotherapy) for many years, Linda closed this chapter when Motherhood beckoned. Linda’s daughter became the recipient of all that heart-and-hands-on energy for ten years (lucky kid), until the day when clay presented itself as a medium which could cheerfully and gracefully absorb, forgive, and adapt to Linda’s creative moldings (the daughter, by now, having had about enough of it). Linda’s first creative love (after motherhood, of course) is fossicking. She collects weathered relics from beach and bush. She spends absolute ages assembling and fiddling with these little bits from her collected Hoard, and sometimes even commits them to permanent positions with glue or cement. (We refer to this practice more formally as “mosaics”). Linda’s second creative love is messing with clay. 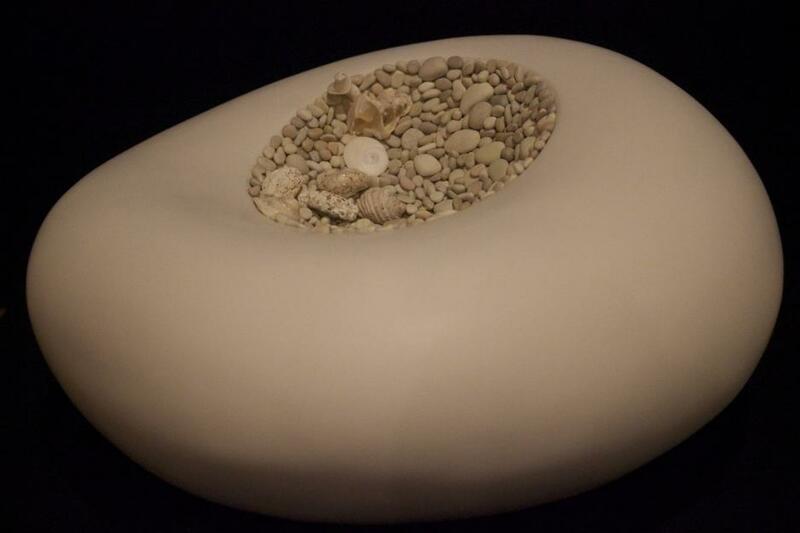 She has found a way to combine these delightful pastimes into a current body of work: her ‘organic’ pebbles, which are sculpted from clay, and embedded with varied mosaic inlays. You can find her in her studio in Avalon on Fridays. If she’s having one of those “messy clay days”, you may have to pull up your own chair. Above: Linda at her Studio - Below: One of her 'organic' pebbles. Willi Michalski’s work is created in stoneware, firing, one-off studio pieces with special emphasis on the firing techniques and glaze finishes. Willi has researched gas reduction firing and glazeon-glaze decoration over the past thirty plus years with resounding success. He often employs sculptural forms in his works. His style is recognisable, particularly as he handles very large scale, generous pieces, which are difficult to execute. Willi’s practice shows his ability to wheel throw forms with great skill and his awareness of the complexity required when firing ceramic pieces to 1300 degrees centigrade in his gas kiln. Willi career as a potter has been highlighted by many exhibitions, including solo shows, group exhibitions and his well known annual home show. His works are represented in public collections in Australia, including regional galleries as well as in private collections here and abroad. As a potter Willi understands the process that goes into making an artwork, the creativity required and the risks one needs to take to be able to translate ideas into artwork. The development of a piece of pottery has many stages before it is finished. One might think of an idea and begin the process on the wheel, then fire the piece. From this point on your inspiration is controlled by the kiln. It is a difficult task as the pieces often change and are developed in the kiln. The potter never knows what the finished work will look like, a true mystery. Willi is pleased every day to go into his studio and start the process again. This is the magic of ceramics but also causes the heartache. Willi Michalski is also known as a teacher for his patience and willingness to allow students to follow their interests, supporting them to create pieces that they will cherish. He taught literally thousands of students throughout his time at Mosman Evening College, as well as in other institutions. He is aware of the joy that comes, knowing they have made the piece themselves. Above: Willi at work in his Studio - Below: One of his wonderful ceramic works. Glass - glowing colours, fluid forms, beautiful beads, molten magic! Penel melts rods of glass in the flame of a large burner and then uses heat and gravity and a few special tools to create all manner of lovely things. From beads that will be made up into gorgeous jewellery, to intricately patterned perfume bottles, to fantastical creatures, every day in the studio is an adventure. 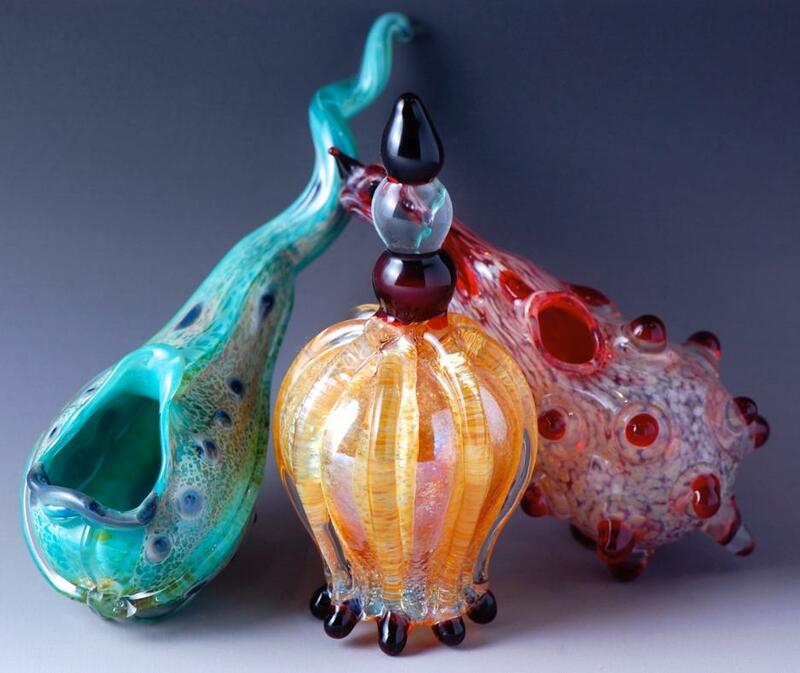 For over a decade Penel has been learning about glass, experimenting with a wide variety of techniques and slowly developing her own personal and very idiosyncratic style. Inspired by both the natural world and the world of her imagination she appreciates the serendipitous nature of molten glass, often letting the glass lead the dance rather than trying to impose her will on it. The studio is open every Friday for visitors to come and experience the excitement of flameworked glass. And for those who fall under its spell, there are a number of beginner classes to choose from, see website for details. Above: Penel at work in her studio - Below - sample of her beautiful works. With a background in art/ textiles (weaving) and craft, I have found my medium in mosaics. The variety of available glass and the way it reflects light inspires me and I love to mix glass, experimenting with its rich and varied qualities with found and recycled objects. Mosaicing offers me boundless possibilities for expression. Meredith uses an exciting range of glass and recycled materials to create contemporary mosaics, shell mosaics and original jewellery. Studio open last Friday of the Month (with the exception of June, July and September due to travel commitments). Meredith is guest artist for the Craft and Quilt Fair throughout 2014 and will be touring capital cities with her mosaics. 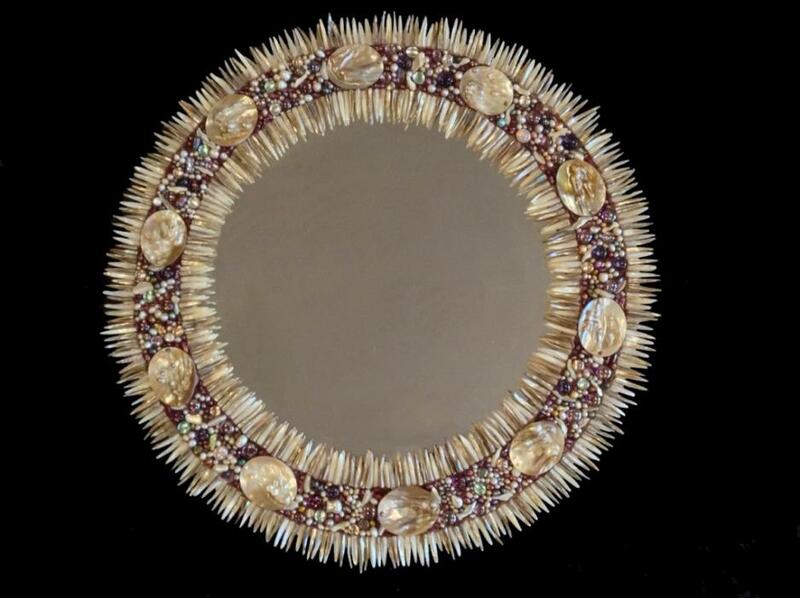 The Sydney Craft and Quilt Fair will feature her shell mosaics (July 9 - 13 at Sydney Exhibition Centre at Glebe Island). Please drop in on the last Friday of the month or call to make an appointment at another time (Mobile: 0425 357 115). Commissions are accepted or browse through mosaics on display. Classes are also available on Fridays. Above: Meredith Scott - Below- 'MIrror. Although I use the spent fruits and opercula (caps) of Angophora, Callistemon, Banksia and other natives, I have a deep affection for the Eucalyptus species especially. I hope that through my pieces, people might gain a greater appreciation of our local, as well as national, native trees and shrubs. Inspiration fascinates me and can appear from anywhere, anytime and from anything. Sometimes ideas flood in almost overwhelmingly and of course at the other end of the scale, you can be faced with a ‘blank canvas’. Sketches are hurriedly made, along with explanatory notes, for fear that the particular idea or source might not reappear. I am Convenor for the Angophora Reserve Volunteer Bushcare Group and there have been times when some of my creations appear as though they could have been specimens retrieved by bush-carers from a billabong inhabited by a bunyip – this idea gave rise to the name “Bunyip Botanicals”. Above: Geoff in his studio. 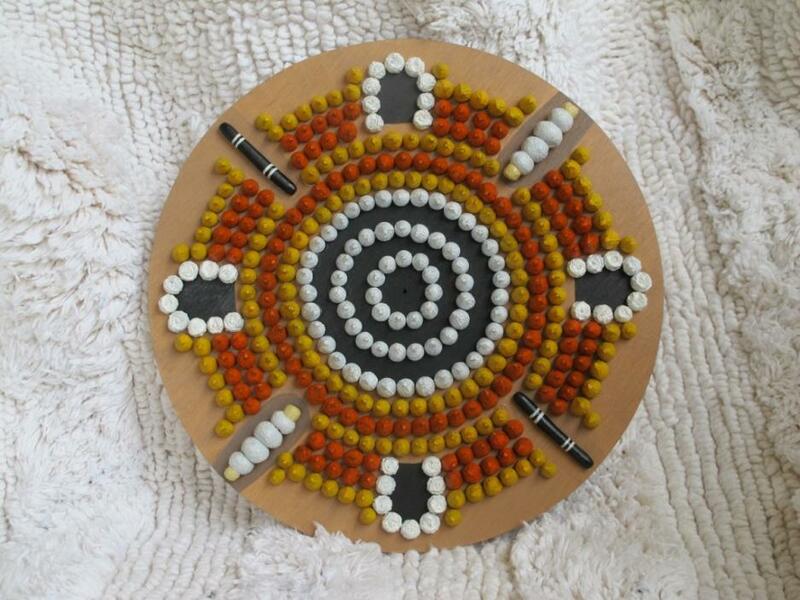 One of his works; Witchetty grub gathering - revisited. Page by A J Guesdon, 2014.